Every year when I get into the heat of Summer, I start not wanting to cook as much. It is always an interesting situation for me, because most of the year all I can think about is cooking. I find myself using a lot more of my blender and less of my kitchen aid, as the heat rises. Yep, a whole lot of dips and spreads being made at my house. Cool food helps beat the heat. 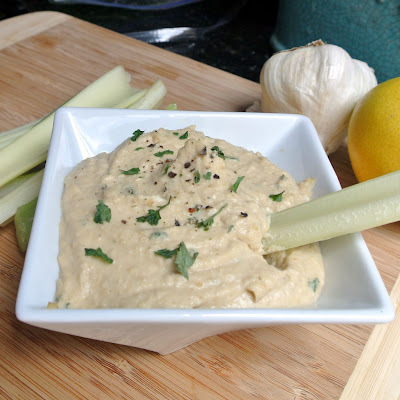 Hummus is one of my favorite dips during the summer. Recently one of my friends served me a rice cake topped with hummus and pickles. I would never have thought to put those flavors together. It was scrumptious! I could eat that every day! If you have not tried it before, I recommend it for a nice hot summer day. Process the garlic cloves in a food processor until finely minced, stopping the processor occasionally to scrape down the sides of the bowl. Add the beans and pulse the machine a few times to chop them coarsely. Next, with the machine running, puree them while you slowly pour the sesame paste through the feed tube. Still with the motor running, pour the olive oil, lemon juice, and soy sauce through the feed tube, stopping the processor occasionally to scrape down the sides of the bowl. Add the salt, cumin, coriander, and cayenne. Process until thoroughly blended, then add water. Transfer the puree to a bowl, cover, and refrigerate before serving. It is great as a dip or a spread, with your favorite veggies, or your favorite gluten free chips or pita. I love hummus! And i have seen so many variations. This one looks as close to the original as possible. Nice addition of soy sauce!